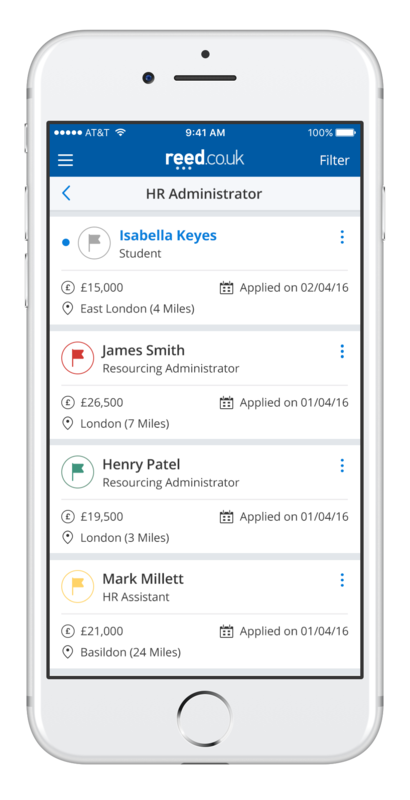 The first of it’s kind in the industry, the reed.co.uk Recruiter App initially started as a pilot with very limited functionality. I joined the project as a consultant to support and mentor a junior UX designer, assisting with testing sessions, wireframing, overall planning as well as completing the finished designs for the project. Working to very tight deadlines we were tasked with condensing a lot of functionality into a very small space, eventually ending up with an app in which recruiters can: post and edit job adverts, manage applications, search the reed.co.uk CV database and view and contact candidates - all from within the app. 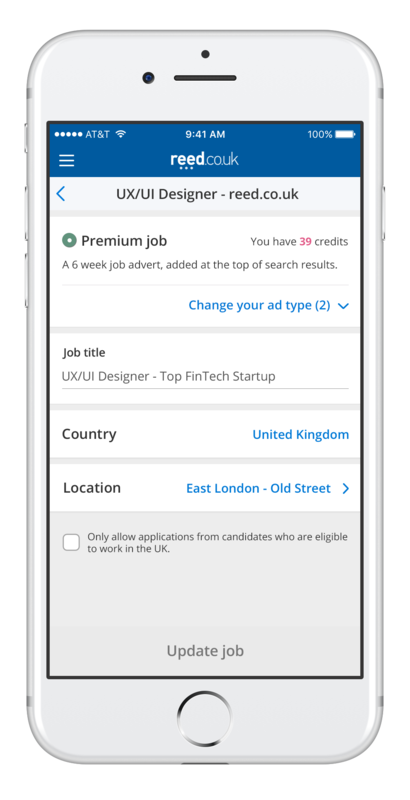 The app initially only allowed users to view applications to jobs that had previously been posted on the reed.co.uk website. 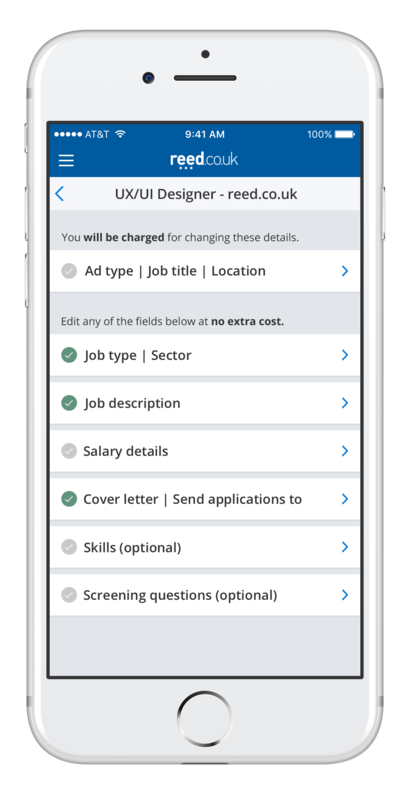 Below are the finished designs for viewing live job adverts, viewing a list of applicants and a candidate profile. You can click/tap any image to enlarge it. 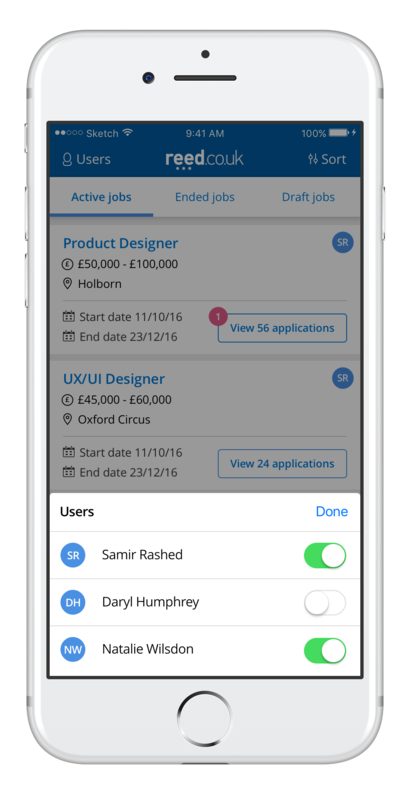 Next we added functionality to allow recruiters to manage their existing job adverts, as well as create new ones. During user interviews it became clear that whilst on occasion recruiters would want to add a job from scratch, they were far more likely to want to edit and then re-post existing jobs - given the amount of information and typing needed to post a job advert. 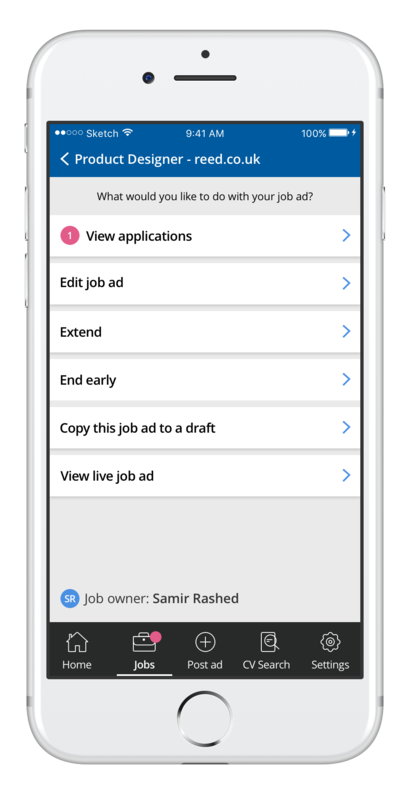 This made the ability to duplicate existing job adverts important as well as being able to distinguish between live, draft and ended jobs. 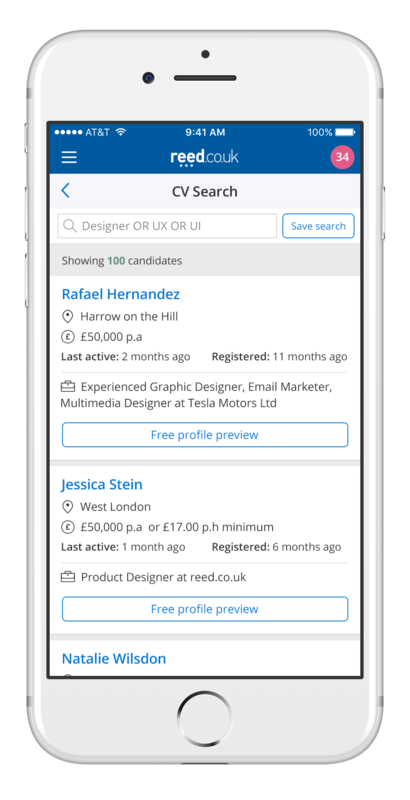 After further testing it became clear that "CV Search" (a feature on the reed.co.uk Recruiter website) was also important for the mobile app audience. I made it clear at this point that having initially used a hamburger menu due to there not being many sections to navigate, we would need to revisit the IA as we were adding further sections. We discussed and estimated what changing the navigation would do to the timelines of delivery and agreed that to revisit it post release. 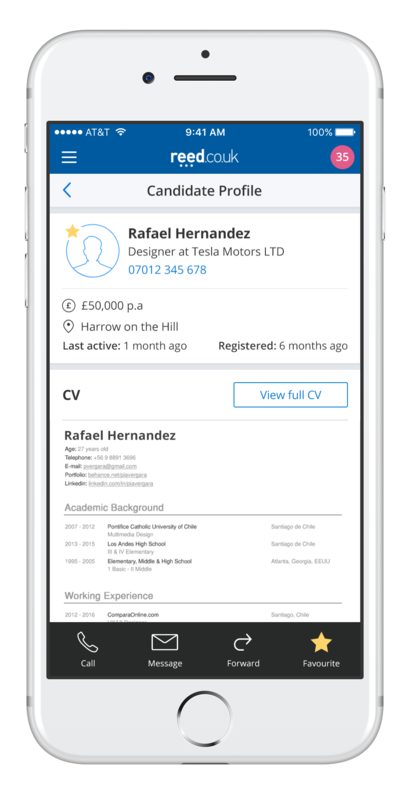 Below are the designs for the CV Search results page, a free profile preview of a candidate (as it costs money to view candidates), and a candidate profile. After we had met our deadlines, we were able to design and test a different navigation style, an always visible bottom navigation bar. This proved to be a far easier way for users to cycle through different parts of the app, minimising the interaction cost as well as freeing up valuable real-estate at the top of the screen. Whilst designing this new navigation we also had a chance to revisit the IA. "Jobs" and "Applications" had previously been separate menu items, however it became clear that they were inextricably linked, so we put everything under "Jobs". 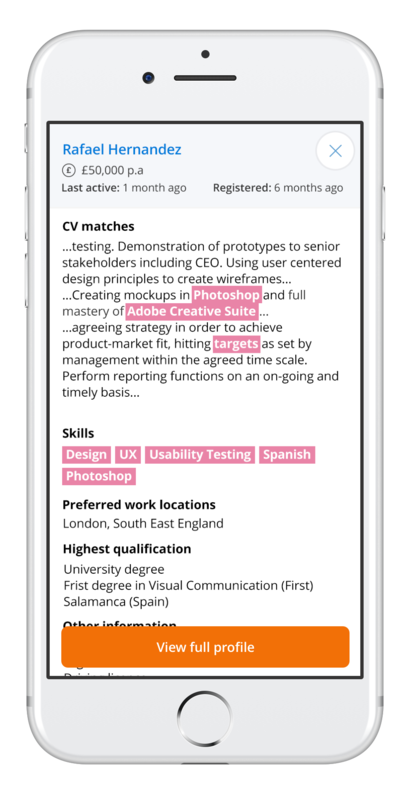 Implementing this navigation style meant that we had to re-design the contact options on a candidate profile, moving them further up the screen. We then conducted further interviews to understand what problems users were having. As multiple users in agencies use the same login we needed a way to distinguish between different user accounts which you can see in the below designs. With the new navigation bar we were able to clean up the top of the screen and remove a lot of the clutter, as well as adding a different button style for sorting and filtering that can be seen below. In testing these designs we got some great feedback to vindicate the choice to move to this navigation style. This project threw up lots of interesting challenges. Supporting a junior UX designer, imparting knowledge and mentoring was a very rewarding experience. Collaborating on design decisions was ultimately the most rewarding, having worked in plenty of teams but often as a sole designer it was great to work alongside another designer full-time. Working with an external development team based outside of the UK led to it's own challenges initially but we adapted quickly. We were also working to very tight deadlines as this project was the idea of our chairman James Reed so it was given a lot of attention - this however is something I'm used to and thrive on. As a team we can be proud of what we achieved with rave reviews so far, and for me personally I am proud of being able to work across multiple product teams with no loss in quality output.